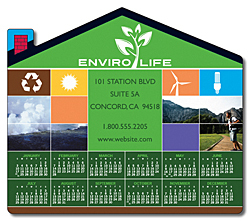 3.5 x 4 inch real estate house shape magnet makes a very useful promotional choice for realtors and other real estate professionals who wish to promote their own business. Advertisers seeking this magnet can always order them in bulk and seek benefits of discounts. We also offer them free shipping, design, and art set up on all orders.